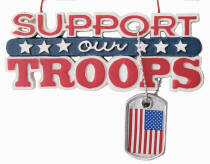 Show your pride in our armed forces with a support our troops Christmas ornament on the tree. If you have a family member proudly serving, we can personalize this ornament on the back with their name and rank in two lines of text. Imported. 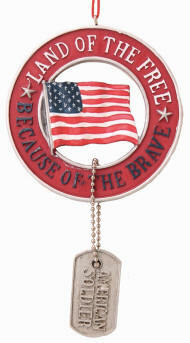 This circular ornament contains a waving flag with an American Soldier dog tag attached by a chain. We personalize this ornament on the back with up to two lines of text. Imported. Resin. 3 in. high. 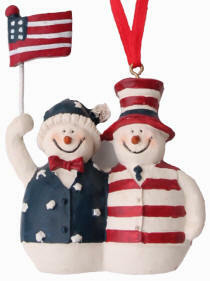 Snazzily dressed in their red, white and blue and proudly waving their flag, these two cute snowmen will look great on your tree. We can personalize this ornament across the bottom of each snowman. 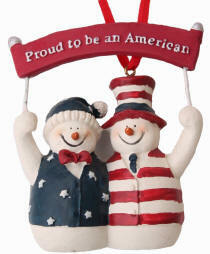 Standing proudly under their banner, these snazzily dressed snowmen in their red, white and blue will look great on your tree. We can personalize this ornament across the bottom of each snowman.